Ingredients for 10 people: Egg noodles 500 gr., Tomino cheese in oil 300 gr., Laudemio 100 gr., Thyme, rosemary, sage, paprika enough, Beef sirloin 200 gr., Butter 100 gr., Valerian 200 g., Black truffle 50 gr., Salt enough, Pepper enough. Clean the beef sirloin, roll it up with the roll film and put it in the freezer for at least 2 hours. Strain the tomino cheese from the oil and whisk it flavouring with the chopped herbs, salt and pepper. 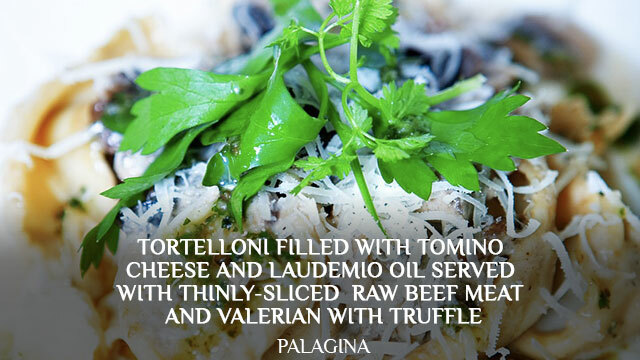 Emulsify the cheese with Laudemio oil until it becomes frothy. Roll out the egg noodles, about 0,5 mm thick, and make discs of 10 cm of diameter. Put all the discs on a table and put on each of them, with the sac-à-poche, the filling prepared previously. Wet a little bit the hems of each disc with water, and then fold each disc down in half, like a crescent shape. Do not let air to get inside the tortellone, close carefully. Cut thin pieces of beef meat and place them on plates. Flavour them with salt and Laudemio. Cook the tortelloni in boiling water with salt, strain them until they are cooked enough and finish to cook them in a frying pan with butter, salt, pepper and some chopped truffle. Add also some water to let all the ingredients to cook in a better way. Place the tortelloni on the prepared carpaccio of beef. Put also a small quantity of valerian salat, seasoned with salt and Laudemio oil. Finish with a thin julienne of black truffle on it.